1.e4 c5 2.¤f3 ¤c6 3.Ґb5 g6 4.c3. Mysterious are the ways of the chess fashion. Perhaps the most logical White`s plan (c3+d4) was replaced by the sly and odd 4.Ґxc6. As it seems to me, the plan to seize the centre has no less rights to exist (it looks like Peter Svidler agrees with me, as he repeated my opening set-up in his encounter with Leko that was played just one day before I wrote this annotation). 4...¤f6 5.e5 ¤d5 6.0–0 Ґg7 7.d4 cxd4 8.cxd4 0–0 9.¤c3 ¤xc3. It`s a surprise in a certain sense. 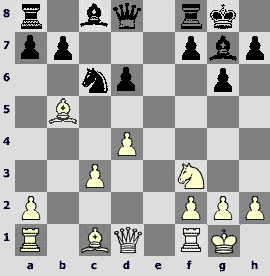 I`ve expected 9...¤c7, as in Valerij's encounter with Quesada in 2003. However, after having lost that game (although I don`t think that the opening caused it) Filippov prepared another variation. Such following is poorly known. More often Black takes on d6 with the queen: 11...Јxd6, whereupon White obtains a certain advantage by 12.a4! It looks like this variation occurred first in the encounter Bronstein – Boleslavsky, 1957, that continued in the following way: 12...Ґf5 (12...Ґg4 13.h3 Ґxf3 14.Јxf3ІSmirin – Zilberman, 1991) 13.Ґa3 Јc7 14.¦e1 Ґf6 15.Јd2 with an advantage of White. Here I spent nearly 25 minutes, trying to find an optimal disposition. There are no less than 6 (six!) logical and positionally justified continuations at White`s disposal. 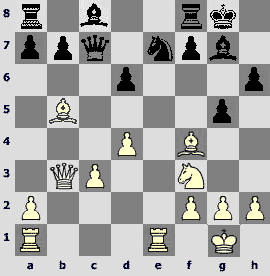 (12.Ґf4, 12.Ґa3, 12.¦e1, 12.a4, 12.h3 and the move that was played in the game). Not coming to a definite conclusion, I relied on my "internal voice" and played 12.Ґg5 Јc7 13.¦e1. 13.Јd2 a6 14.Ґd3 Ґg4 (14...Ґe6!?) 15.Ґe4 Јd7 doesn`t bring White an advantage, but basically I didn`t want to hurry up choosing the queen`s route. 13...h6. In the above mentioned game with Svidler Leko played 13...Ґd7 and after 14.h3 ¦fe8 15.Јb3 a6 16.Ґd3 Ґe6 he obtained equality. 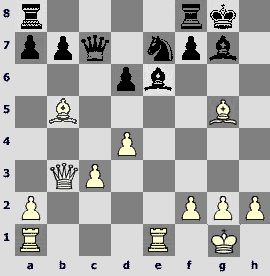 However, Black could face quite difficult problems after 14.Јd2! (in comparison with possible 13.Јd2 White has an extra tempo in many variations). b) 18...hxg5 19.Јh5+ Ґh6 20.Јxe8 Јd8 (20...Јg7 21.Ґxd6 Јh8! 22.¦e1! Јxe8 23.¦xe8,and Black has serious problems, because he can’t easily remove the pin) 21.Јf7+ (21.Ґg8+ ўh8 22.Јg6 Јxg8 23.Јxh6+ Јh7,and White has to give a perpetual check or to play 24.Јxg5 Ґd7 25.Ґxd6 ¦e8 with a very unclear position) 21...Ґg7 22.¦e1 (22.Јh5+ Ґh6 23.Јf7+ Ґg7 a move repetition would be too cowardly, however after 22.¦e1 or 22.f4!? planning 22...g4 23.Јh5+ Ґh6 24.Ґh4 Black has a tough time...). Here there`s only one of many possible ways that shows the danger of Black`s position – 22...Јf6 23.Јh5+ Јh6 24.Јf7 Јg6 25.Јg8+ ўh6 26.f4 g4 27.Ґh4 Ґxd4+ 28.cxd4 Јxg8 29.Ґxg8 ўg7 30.Ґc4ќ. What now? Of course, I could play 16.Ґg3, 16.Ґd2 or 16.Јc4, but I considered mainly 2 moves – 16.Ґxg5 and 16.¤xg5. I couldn`t calculate everything; however, taking into account not only chess reasons, but also the fact that Filippov usually prefers an attack to a defense (even with an extra piece), I`ve played 16.¤xg5!? 16.Ґxg5 hxg5 17.¤xg5 Ґf5 18.¦e3 (18.Јd1!?) 18...d5 19.¦ae1 also looked quite tempting, but I didn`t manage to find something worthwhile after 19...Ґf6. 16...hxg5 17.Ґxg5 Ґe6? A mistake! Certainly, White has a dangerous initiative, but now Black really gets in trouble. 17...¤g6 18.h4 (18.Ґd3 Јa5! )or 17...¤f5 18.Ґd3 could lead to the very difficult positions, when White would have a decent compensation, and Black would have to find the only moves to avoid a defeat. 18.¦xe6! fxe6 19.Јxe6+ ¦f7 20.¦e1. Despite an extra rook, Black's situation is lamentable. White bishops dissect the board, whereas heavy pieces control one of the most important files –"е". 20...a6. I wasn`t able to invent anything convincing after 20...Јxc3 21.Ґxe7 Јxd4 22.Ґc4 (22.Ґxd6 Јxf2+ 23.ўh1 ўh8 24.Јh3+ ўg8 25.Ґg3 Јf5) 22...Јxf2+ 23.ўh1 ¦e8, however, later on I found out 24.¦d1! Јf4 25.Ґxd6! ¦xe6 26.Ґxf4 with real chances to convert an extra pawn in the Endspiel that occurs in case of 26...¦e4 (26...¦xf4 27.Ґxe6+ ўh7 28.g4) 27.Ґxf7+ ўxf7 28.g3. 21.Ґa4! It`s the only move because 21.Ґc4 d5 22.Ґb3 ўf8 allows Black to consolidate. 21...¤c6. Even 21...ўf8 22.Ґd7! Јd8 23.f4 cannothelp.Black is completely paralyzed, and the result of the game is absolutely clear. 22.Ґb3 d5. A dismal necessity. Valera intended to play 22...ўf8, but this had a beautiful refutation: 23.Ґf4! ¦d8 24.Ґxd6+! Black gets mated; and of course 22...¦af8 doesn`t help because of 23.Јg6! followed by 24.Ґc2. 24...Јd7 25.Ґe6 Јe8 was a bit more stubborn. I intended to choose between 26.Јh7 and 26.Ґh6, whereas a computer insists on 26.Јb1!? with a decisive advantage of White. 26.h4! Under the bishops` patronage the modest ''h''-pawn that was dreaming on general`s epaulets for a long time starts its campaign for a glory! 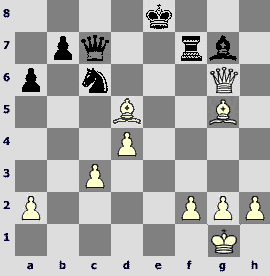 The most interesting thing is that this is the only winning plan for White in spite of his superiority. 26...ўf8 27.h5 Јd7. A desperate attempt to muddle water. Here I reflected for a few minutes and calculated everything till the end. 28.Ґe6 ¤e5!? 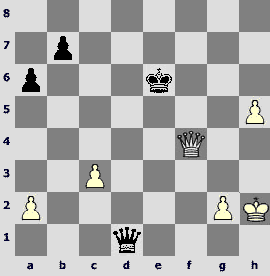 This was the idea of Black.29.dxe5 Јd1+ 30.ўh2 Ґxe5+. 30...¦xf2 31.Ґf6 ¦xf6 32.exf6 Јd6+ 33.g3 Јd2+ 34.ўh3 couldn’t save Black, but of course I should have anticipated and examined this possibility. I was very pleased that the victory in such an important game was achieved owing to such beautiful and uncalculting piece`s sacrifice. Unfortunately, while carrying out an analysis with my pet (P4, 3.06 GHz), I found out that 16...¤g6!! (it seemed to us losing during the game because of 17.¤xf7, but for all that we`ve missed 17...¤f4!, and White has no clear discovering check) could doubt the whole idea of White. I guess I can console myself with a bit modified words of the great politician and writer:"The necessary quality of every strong grandmaster consists of an ability to predict – to predict what will happen in one move, in 5 moves and in the end of the game". But I`m afraid that after 16...¤g6 I should finish this thought in a following way: "... and then you should be able to explain, why nevertheless it hadn`t happened". Fortunately, my daring play that quite often costs half-points in a tournament table and points in the rating list, had completely paid its way at the Aeroflot Open, where I managed to achieve one of the greatest successes in my chess career.